As the most visited country on the planet, France has long attracted tourists who flock to visit its iconic cities & institutions; take wonder at its stunning natural scenery & diversity of landscape and are in awe at its Roman & medieval history that has left its mark on both the built environment & culture. France, too, is known the world over for its food; where every town and city offers its own delicacy, produces its own cheese and has recipes passed down through the generations that have led to its identity. Historically, food was at the heart of most French communities and the local bistro was a focal point where French classic dishes from bœuf bourguignon to Blanquette du veau, baba au rhum to île flottante were served. As classic as the dishes themselves, was the buffet style of service ‘en famille’ where large stainless steel (sometimes silver) chafing dishes were lined up at the back of the bistro, allowing the wonderful aromas of each to escape as the lid was raised. With the emergence of a more diverse culinary offering and, to a lesser extent, the impact of fast food, many of these local bistros have disappeared and, with them, some of these much-loved dishes, local recipes & a style of service that was as typically French as the two-hour lunch break during which they were enjoyed. In 1989, visionary restaurant owner Louis Privat, opened Les Grands Buffets as a “window into the world of French cuisine” – he lamented the demise of the local bistro and his passion was to restore this, not town by town, but in one venue in the southern French city of Narbonne, his home. On a typically bright & sunny late-November day, my partner & I were privileged to join Monsieur Privat for lunch and discover his passion for what he created, nurtured and still clearly loves, more than 25 years on. 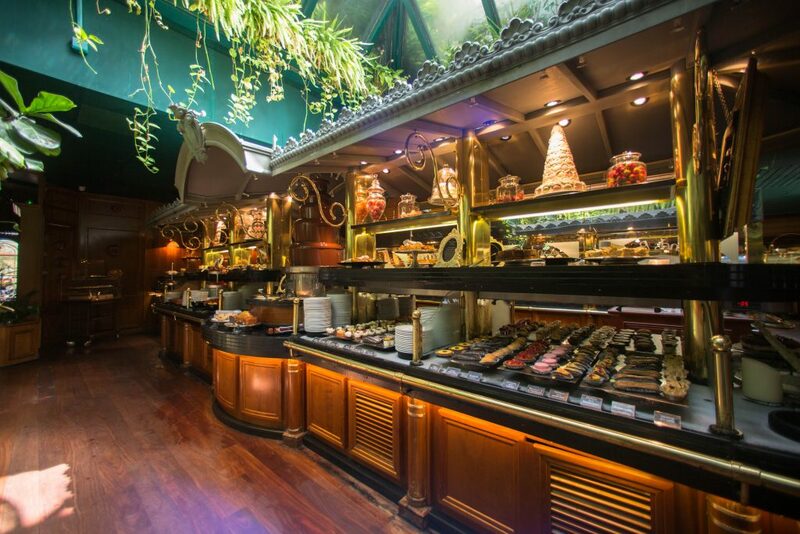 In simple terms, Les Grands Buffets is fine dining meets a large hotel buffet – but this does not do it justice, it does not even come close in describing the experience. 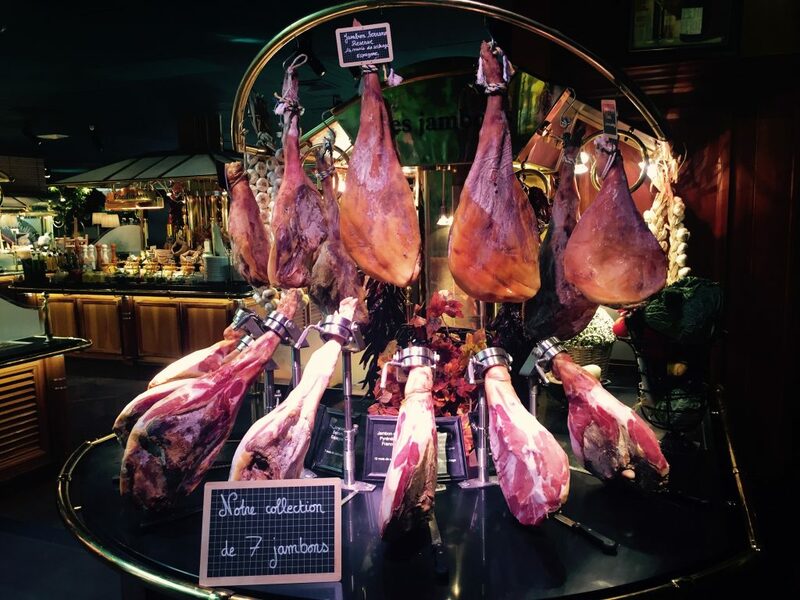 For one price of 32.90€ (half price for 6-10 year olds and free for 5’s and under) diners are treated to a vast choice of foods which, in the main, originate or are produced in the region around Narbonne, the newly named Occitanie (the 2016 merger of the Midi-Pyrénées & Languedoc Roussillon). On arrival, you are greeted warmly, and genuinely, by a member of staff and personally escorted to your table, which is yours for the duration of either the lunch or dinner service so you do not feel rushed. Here the elements of fine dining shine through with crisp white linen tablecloths & napkins, polished silverware & glassware and you will be seated (as per your choice when reserving) in one of three great dining areas; one outside during warmer months is a stunning, almost tropical feeling, garden terrace and two inside, including a dining room more suited to families. Asides from selecting from an extensive wine list, you don’t have to worry about deciding on which dish to choose as everything is included and the feast that is about to hit the senses truly does need to be seen to be believed. The ‘buffet’ itself is displayed (and displayed beautifully) in three main rooms – seafood, cheeses & charcuterie is the first port of call. Here you will find wonderful antipasti; local oysters, crabs, clams, mussels & prawns; fois gras (served six different ways) and one of the most diverse array of charucterie you will ever see. If fromage is for you, you may never want to leave this section! 70 different cheeses (to be increased to 100 from 2017, making it the largest selection in any French restaurant) from every region in France, some from further afield, are a discovery in themselves. 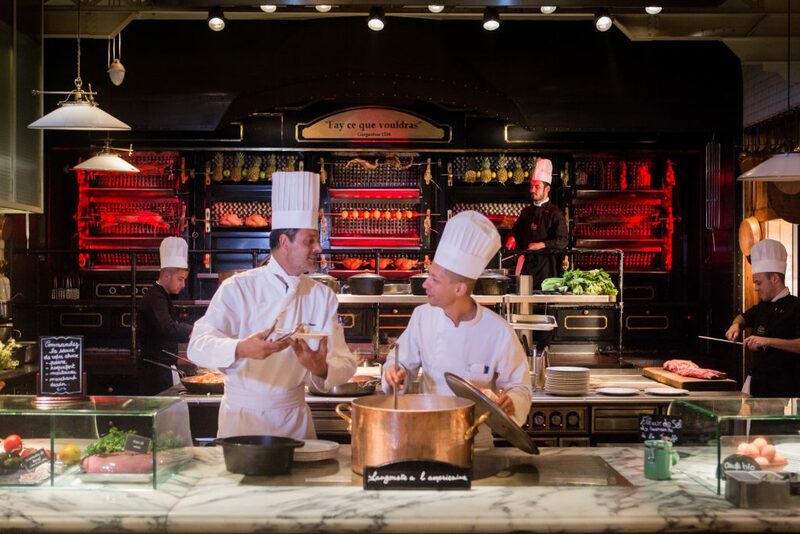 Remembering there are two-more “courses” to your Grands Buffets experience, the second and largest section features the aforementioned chafing dishes – each containing a mouth-watering creation from a rich daube of beef to ratatouille, breaded frog’s legs to confit duck. The sheer variety of what’s on offer aside, the room also contains the pièce de résistance of Les Grands Buffets, their rotisserie which towers over the chefs below who prepare dishes to order – from suckling pig to lobster thermidor (you have to pinch yourself to remind you of the value your meal represents, each individual dish from the rotisserie section alone would cost more than the 32.90€ you are paying for your whole dining experience if enjoyed at any other restaurant). To complement the food, another major feature here is the wine list with every bottle charged at the cost price the restaurant pays the vineyard. Not only that, but each of the 70 bottles can also be enjoyed by the glass – all adding up to a staggering 80,000 bottles being consumed by guests annually (the largest consumption of any independent restaurant in the country). By this point of your visit you have in mind that there is still one, yet highly important, section left to visit – the desserts (or do you, like me, revisit the cheese section!). As with each aspect of the restaurant you have sampled before, you will not be disappointed with your sweet finalé; the pastry chefs in the kitchens are kept busy throughout the day preparing over 100 different desserts including gateaux, ganache, eclairs and, as we later find out behind the scenes, the quintessential macarons which must be a favourite as 1,000 are consumed every day. As a guest of Monsieur Privat, we were very fortunate to be afforded the opportunity to see at first-hand how his passion extends far beyond what the customers see and taste, with equal importance given to the working environment for his staff, most notably their kitchens. State of the art air conditioning, background music, etched artwork on the stainless-steel units and dividing up the workspace so that noisy machinery is housed in sound-proofed rooms away from the main kitchens, are just as visionary as the whole concept that is Les Grands Buffets. As we shake hands to leave, Monsieur Private takes out a sketch book containing some artistic impressions of yet further improvements to be made in 2017. He explains that to encourage guests to return time after time, he must expand what is on offer yet keep to his principle of quality food at exceptional value, available to all – the 300,000 guests who pass through the doors to this culinary institution each year are probably the clearest signs that he is right. Les Grands Buffets is open 365 days of the year and reserving a table is very simple via their website (which is easy to navigate in four languages). You can normally reserve up to 7 days prior, although to accommodate the huge influx that July & August brings (where 1,000 people a day are turned away) the booking calendar is extended. However, do plan your visit well in advance and combine it with the wonderful city centre of Narbonne where you can discover the City’s Roman origins, stunning cathedral, Canal du Midi and a number of art galleries & markets.